Ceramic grills are often quite expensive compared to their metal counterparts. Why then do people buy them? Well there are several theoretical and practical advantages to a ceramic type grill that make them worth it for the most devoted outdoor chefs. One of the most obvious and defendable advantages is temperature control. These grills make precise temperature control from very low smoking temperatures up to searingly hot temperatures easy. Beyond that, there are several theoretical advantages which make them very popular with devotees. At the same time, many people admire their versatility but feel that their less expensive kettle grills and smokers can perform just as well, without all the weight and cost. Below is a comparison of some of the advantages and disadvantages of these types of grills, both practical and theoretical. Precise Temperature Control: One of the biggest advantages of the best ceramic grills is their temperature control. While some of the other issues can be hard to prove that they make a big difference, this one is clear. It all comes down to construction. These grills are made of porcelain glazed ceramic. The ceramic used is an advanced material which is extremely efficient at retaining both moisture and heat. For this reason, temperature control is precise and easy. Whereas getting a kettle charcoal grill to an exact temperature (especially very low or very high temperatures) and keeping it there can be a chore, or damn near impossible in some cases. Because of the efficiency of these, your temperature can be dialed up and down almost as easily as in your kitchen oven! Simple adjustments of the dampers which alter the amount of airflow through the grill and getting to your charcoal turns up and down the heat. More air (dampers open) for higher heat, less air (dampers more closed) for lower temps. It is quite easy to get these grills to go anywhere from super slow cooking levels (150-200 degrees) to super hot searing levels (up to even 700 degrees!). Charcoal Efficiency: Another advantage of the ceramic grills' construction and heat retention is that charcoal is used much more efficiently. You don't need as much charcoal to reach the same temp and your charcoal burns longer because you aren't loosing heat as waste. You can keep it slowly smoldering along for hours. Even better, when you are done cooking, simply close all the vents and your charcoal will extinguish super quickly and you can often use the same charcoal again the next time you cook. Versatility: Because of the great temperature control and the ability to adjust the temp from very low levels up to very high, you can do practically any type of grill cooking or smoking in a ceramic grill. You can even do a lot of things that you didn't even consider on a grill. 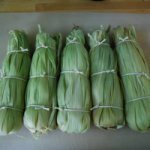 For example, at low temperatures you can very slowly roast or smoke all kinds of things to their tender, succulent best over hours. At the other end of the spectrum, at around 700 degrees ceramic grills can be used either for quick searing steak or even as a stone oven to cook pizza, bread or even cookies! Most brands of these grills have several optional accessories that make all kinds of cooking possible. 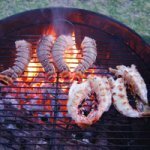 Moisture Retention: One complaint a lot of people have about grilled foods is that if you are not careful, you can overcook and dry out your food to a leathery, toughness that isn't very appealing. While practice and good technique can avoid much of this with any grill, the ceramic of these grills is quite good at retaining moisture, certainly better than metal grills. So all the succulent moisture in your food stays within your grill as it cooks, keeping it tender and juicy. Ease of Use: Quick easy charcoal starting, quick and easy temperature control and accessories that make all styles of grill cooking and smoking a snap make these some of the easiest grills to use. No Metal: Some people complain that metal grills can impart a metallic taste to food, particularly those that have not been seasoned well or those that are old and starting to rust. Which I personally can't say I've really found this to be a problem with my metal grills, it is a theoretical concern at least. These grills are made from neutral ceramic which does not impart any aromas, flavors or anything else to your food, allowing the ingredients and wood smoke to shine. Safety: The thick ceramic of these grills withholds heat very effectively. One of the results is that the outside of the grill rarely gets very hot, even at high cooking temperatures inside. 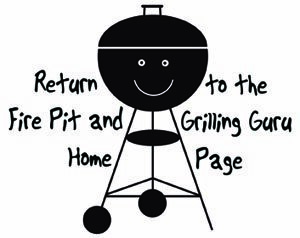 Grillers with kids running around or who are clumsy and prone to accidents may find this to be comforting. Now don't go holding your hand on these grills! But the porcelain glazed ceramic will certainly take a lot longer to burn you than a hot metal grill lid or sides. Cost: One of the biggest downsides to these ceramic grills is their cost, which is prohibitive for many grillers. The large models can cost from $700 to over $1000 easily, not including stands or tables and accessories. Compared to a basic and classic Weber kettle grill at $100 or less it can be hard to justify the expense. But for tried and true grilling aficionados, sometimes only the very best is good enough, money notwithstanding. Whether it is worth it is up to you and your priorities. Most types of grill cooking can be done perfectly fine on a good kettle grill. But for versatility, particularly attaining very low or very high temperatures, these grills may be worth it to you. Weight: Because they are made out of thick ceramic, these are heavy mofos! Unless you have a very sturdy stand or table with heavy duty casters, these are not easy to move around. Most weigh at least 200 lbs! Charcoal Type: Because ash production is a concern in these grills, basic, cheap charcoal briquettes are not recommended. It is highly recommended that you only use good hardwood lump charcoal. These charcoals tend to be a lot more expensive. However, because of the efficiency of the grill, you may not actually spend too much more on charcoal than with a less efficient grill. Cracks? I have heard some reports that with age and extensive use, some lids have developed cracks in the porcelain. Whether this affected the function of the grill I have not heard. I personally have not experienced this problem and don't know anyone personally who has. It raises the suspicion that the grill wasn't very well cared for in the first place (not covering it between uses, banging the lid around carelessly, etc.). 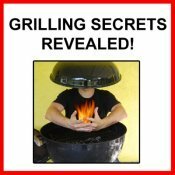 Done learning about the pros and cons of ceramic grills?